The financial industry has been under audit scrutiny ever since the enactment of the Sarbanes-Oxley Act. Sarbanes-Oxley, also known as SOX-404 or Sarbox, mandates that all publicly-traded companies must establish internal controls and procedures for financial reporting and must document, test and maintain those controls and procedures to ensure their effectiveness. When the U.S. Congress passed the Sarbanes-Oxley Act, the intent was to drive improvements in companies’ internal controls. The benefits were seen as greater assurance to shareholders and other stakeholders in published financial reports, while compliance costs were of lesser significance and were dramatically underestimated. However, cost is of tremendous importance to corporate executives. While they have an obligation to provide an effective system of internal control that provides assurance regarding the integrity of financial reporting and the safeguarding of assets, there should be a balance between the cost of those controls and the risks they are managing. Logical Access - This control provides reasonable assurance that financial/critical reporting systems and subsystems are appropriately secured to prevent unauthorized use, disclosure, modification, damage or loss of data. Segregation of duties is an essential step for access controls because we want to assign the right personnel to access the right data and software in the right business tasks. System Administration and Monitoring - This control provides reasonable assurance that IT components, as they relate to security, processing, and availability, are well protected, would prevent any unauthorized changes, and assist in the verification and recording of the current configuration. For example, the control requires that system audit logs are active and monitored to ensure unauthorized activity is detected. Change (program) Management - This control provides reasonable assurance that system changes of financial reporting significance are authorized and appropriately tested before being moved into production. Any changes should be documented and maintained. IT Operations - This control provides reasonable assurance that recorded, processed and reported data remain complete, accurate and valid during the update and storage process. It is highly recommended to implement operating system security patches to evaluate the relevant security vulnerabilities and to ensure that security risks are mitigated as soon as possible. Auditors have been focusing on IT General Controls as dictated by audit governing bodies such as the PCAOB. SSH keys have been under the radar being a critical part of production plumbing that has not gotten the deserved attention. Industry reports draw attention to the fact that financial audit outcomes are consistent year after year. Whereby the majority of audit findings and exceptions further highlight new or unforeseen weaknesses for the logical access, privileged access, program or change management and operations controls. The findings in many cases are associated with new applications, new technologies, or are identified based upon discovered vulnerabilities which were not considered during prior audits. Organizations within the financial industry continually face audits year after year to ensure that they are compliant with various laws and regulations whether they are government or association based. Financial organizations take extra measures to ensure trust is in place for their customers by adhering to industry best practice standards and guidelines to minimize the risks that could lead to a potential data breach or loss in trust. The common digital security theme across all organizations is “It’s Not a Matter of If, But When!”. As a result, many leading experts in the security industry state that organizations may have already suffered a breach, but they don’t yet know it. It goes without saying, the threat landscape is always changing based upon the evolving vectors being utilized to try and gain access to protected data. Protected data goes beyond information such as social security numbers; the government, regulating bodies and industry standards have become more stringent as government agencies are conducting compliance audits which come with hefty fines; and much more. SSH Communications Security product offerings can help your organization achieve compliance related to common issues and exceptions that are repeat findings among financial organizations audits. The threat landscape is constantly changing based upon the evolving vectors being utilized by internal and external attackers that seek access to protected data. Protected data goes beyond information such as a social security numbers. The government, regulating bodies, and industry standards have become more stringent as government agencies are conducting compliance audits which come with hefty fines and in some cases personal criminal liability on executive management. SSH Communications Security product offerings can help your organization achieve compliance related to common issues and exceptions that are repeat findings among financial organizations audits. Formal job descriptions are used to delineate employee responsibilities and provide for adequate segregation of duties. Unable to effectively enforce key segregation of duties without a basic understanding of a user’s role in the organization. Properly deployed SSH keys and continuous monitoring of their usage ensures access compliance with approved job descriptions. Provision and monitor user access according to the user’s role and applicable policies. Adequate segregation of duties exist so that systems and programming personnel do not have update access to production data or software on a regular basis. IT personnel have access levels that weaken or eliminate segregation of duty controls. Production data is modified without appropriate controls. Inventory and monitor usage of SSH keys to ensure only authorized access to production environments is permitted. Centralized visibility of encrypted remote system access, privileged user activities and data transfers. Terminated company employees are removed from systems within a reasonable timeframe. Access to critical production systems by terminated employees or anonymous access by a current employee. Ensure all access is immediately removed upon terminations and/or transfers. Centrally revoke access to provisioned systems. System audit logs are activated and monitored to ensure unauthorized activity is detected and the integrity of key data elements is maintained. Inadvertent or malicious changes to critical production data may not be prevented or detected timely. Universal SSH Key Manager access review reports include all access including temporary and 3rd party contractors. User Portal enables easy provisioning and tracking of 3rd party access. 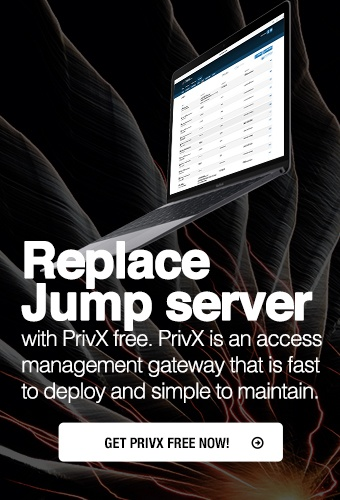 PrivX On-Demand Access Manager manages and audits privileged access. Only authorized individuals may authorize and approve production changes to begin build/test tasks, and that ability must be reasonable for their current job function. Approvals ensure that changes do not progress through the change process without appropriate review. SSH keys assigned to ensure only authorized users can release changes to production environments Logs and video replay capabilities to reconstruct encrypted sessions that may have caused production processing failures. Access to modify or cancel scheduled and batch jobs is limited to only a small number of personnel. Uncontrolled changes to manual and automated job schedules in the production environment can result in missed processing deadlines, ineffective backup, and system downtime. Leveraging Universal SSH Key Manager to ensure only authorized access is granted with the ability to modify production processing jobs. Logs and video replay capabilities of CryptoAuditor allow to reconstruct encrypted sessions that may have caused production processing failures. SSH key usage is one of those unseen workhorses in a financial organization’s IT infrastructure. It can also be referred to as the “dark side” of compliance because many organizations have no visibility into their SSH key usage or management and assume compliance is in place with their SSH key environments. That is until an auditor identifies the issue or exception in their review and associated findings report. SSH keys are a critical component for ensuring adequate and compliant controls for your production environments and they need to be managed and monitored on an ongoing basis to ensure risk and compliance are to be addressed appropriately. Without sufficient tools in place to reliably and clearly connect SSH keys to trust relationships and users throughout a network, enterprises will continue to face unacceptable levels of risk in terms of how public and private keys are being used. Whether you are going through an audit, conducting a risk assessment, investigating a breach, etc. ; SSH Communications Security products are an excellent and critical asset for every step you take along the compliance path. Whether you are an audit committee member, an internal audit member, a security team member, a member of the senior management team you can no longer ignore the criticality of properly deployed and managed SSH keys within your environment(s). Take immediate action now before an auditor identifies SSH key management is an issue. Depending on your auditor and types of attestations you make, this type of issue may be external (customer and partner) facing. The good news is that the initial steps in dealing with SSH key management are not difficult or costly. Initially organizations must find out to what extent their environments are exposed to the risks identiﬁed. Skilled personnel with the right tools can accomplish these initial steps within a matter of days. Delays in addressing SSH keys may result with exponential cost increases, additional audit findings or exceptions and increased risk of a data breach. SSH Communications Security offers training, services and products that help organizations address the potential issues raised. Working together with your staff, we can provide a comprehensive evaluation of your current environment and recommend effective approaches for remediation and management of your SSH keys. For further information, please download our whitepaper What Financial Institutions Need To Know About The Management of SSH Keys.